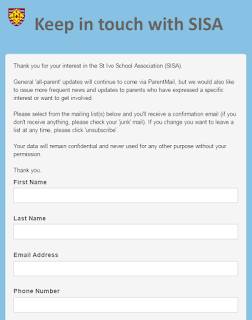 ParentMail is great, but we don't want to bombard all parents with every message or reminder from SISA. We'd also like to know which parts of SISA you'd like to support, whether it's joining a committee or sparing an hour or two on an ad-hoc basis. To help us do just this, please click on the image to the right or link below and join the mailing list(s) that are relevant to you. * ie join our list of would-be volunteers who SISA can approach in the future. Please note that we are not asking you to commit a particular amount of time; any time, however small, is gratefully received. The form is very quick and easy to complete and it's just as easy to update your preferences or unsubscribe in the future.